Lift scanner cover and place document face down on the glass panel. 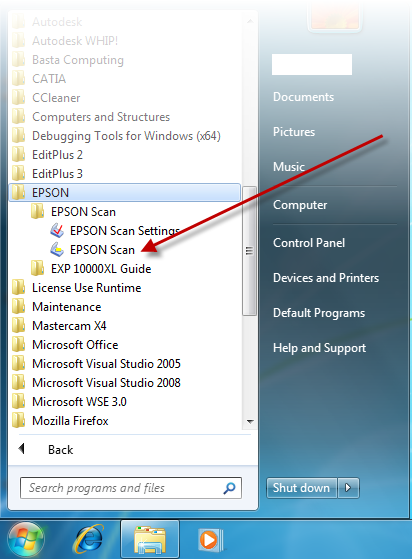 Go to Start -> All Programs -> EPSON –> EPSON Scan –> EPSON Scan. for Image Type, select the desired type. (Note: if you will attach the image in AutoCAD and trace it, then Black & White is recommended). for Destination, select the document size, orientation, and resolution. Click Preview. 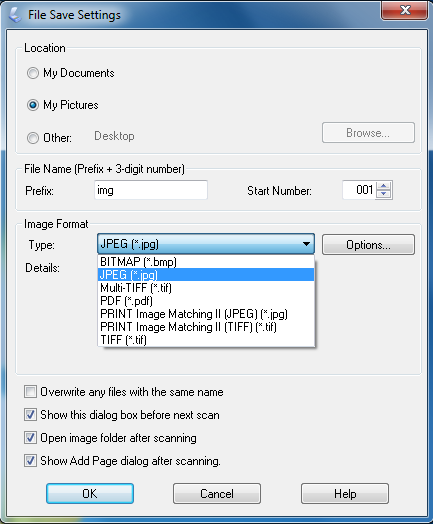 Adjust the above settings and your document in the scanner if necessary. for Location,select My Documents, My Pictures, or Other and browse to a folder. for Filename, change the prefix if desired. for Image Format, select a type (Bitmap or Jpeg is recommended). REMOVE the Document from the scanner.